Last week I wrote about attachments: basically buffs and debuffs for characters. This week I’m going to talk about an extension of that system that lets you change the board itself. Terrain modification is pretty key to any fantasy tactics game. Where would we be without a wall of fire or a pool of bubbling acid? Card Hunter handles this kind of stuff using the same attachment system we use for character status effects, only instead of attaching a card to a character, you attach it to a square on the board. When you play that card, you target a square within range (8). The card goes from your hand and attaches to that square. 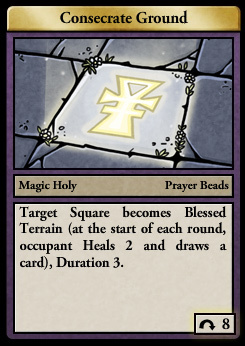 From now on, anyone standing in that square at the start of a round gets the effects described on the card applied to them: in this case, healing and card drawing. Nice! Pretty cool, huh? 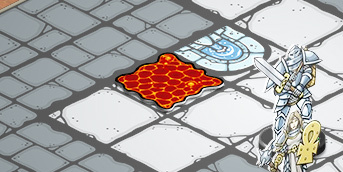 So, how do you tell what card caused that lava pool and what it’s effects are? You mouse over the terrain overlay and the card pops up to tell you what it’s all about. How can we get away with this for terrain when we couldn’t for character buffs? Well, we only allow one terrain attachment on any one square and we have a lot less total types of terrain attachments in the game. It makes sense, right? You can’t really have a lava pool on top of an acid pool on top of mud but you can be stunned, confused and enraged at the same time. Another thing to note is the Stop keyword. This works exactly like having to halt when you move next to an enemy – any move that takes you onto the acid has to stop. That means that you can’t just skip through the acid without suffering the consequences. Of course, if you have extra move cards in hand, you can play them to keep moving in your next turn. 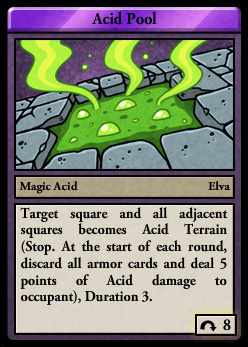 Now, the damaging acid effects don’t take place until the start of the next ROUND, so it’s a good idea to try to cast the acid near the end of the round, once your opponent has blown all their move cards. The final thing I want to comment on is the fact that the acid creates up to nine squares of terrain attachments. How can one card be attached to all nine squares? The answers is, that it isn’t. Instead, when the card needs to attach to an extra square, we create a temporary copy of it. That copy behaves identically to the original except that when it would be discarded, or returned to your hand, it is instead destroyed. 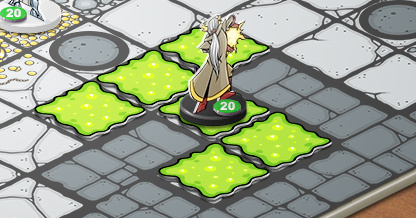 And that’s the terrain game – a very important part of Card Hunter. Every journal entry reveals another simple yet sophisticated game mechanic. I am looking forward to having to think in a game for a change. How difficult is the game going to be? Are there going to be difficulty settings? Or possibly optional goals (win the battle without a character dying, use one of each card type, etc.)? @Shrodin: at the moment, the plan is to add achievements to each adventure, some of which will be beating that adventure on a higher difficulty level. More characters? Sure, can do. Can the next diary (or a simple post) be about how multiple characters/parties are going to work? Every party is made up of 3 characters you create… but is that a locked team? Can you swap out characters? If so, how many characters will each account be able to hold initially? If not, surely each account will have access to multiple parties then? If so, how many ‘parties’ will each account be able to have initially? Interesting terrain manipulation! I can already think of potential strategies based on it. @Matt: you can swap out and change characters from your party. Eventually we want to add the capacity to have multiple multi-player parties so you can create lots of different builds. As for how many characters you can have, I’m not sure yet. That’s a detail we still need to iron out. Are there any plans for eventually doing a multiplayer coop mode? If so, I know one friend that will be as excited about the game as I am. @Phantom Mouse: we have plans, but co-op probably won’t be in the initial release. Great! Just the fact that there’s plans to will be enough to get him to at least try the game.